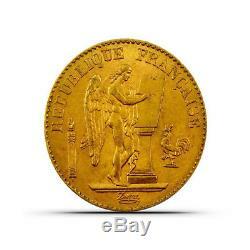 France 20 Francs Angel Gold Coin - 0.1867 oz - Random Date - Extremely Fine (XF). The obverse of each Gold Angel is a recreation of Augustin Dupr&###xE9;'s original design, which first appeared on the 1 Louis D'Or gold coin in 1792. Dupr&###xE9; was France's fourteenth Engraver General of Currency, holding his post during the French Revolution. According to legend, Dupr&###xE9; narrowly escaped the guillotine, thanks to the Gold Angel he carried in his pocket (and used to bribe a guard). Beginning with that pivotal moment in history, the French coin came to be known as the Lucky Gold Angel &###x2014; a talisman even carried by Napoleon Bonaparte, until he lost it the evening before his devastating defeat at the Battle of Waterloo. Brief History of the Gold Angel First introduced in 1360 to pay a ransom for King John II, the franc was re-established as an official form of decimalized-currency by the French Revolutionary Convention of 1795. During Napoleon's rule as First Consul Regime in 1803, the 20 Franc Gold Coin was put into production, and by the end of Napoleon's reign in 1815, the coin came to be known as the napol&###xE9;on. Beginning in 1848, the Paris Mint briefly revived the 20 Franc with Dupr&###xE9;'s angel design. Gold coinage was completely suspended during the First World War, and after WWII, 20 and 50 Francs were produced using an aluminum-bronze alloy. The Euro was officially adopted in 1999, and by 2002, the 20 Franc was no longer circulating. About the Paris Mint The Paris Mint was established in 864, making it the oldest institution in the entire French Republic. The hotel was originally owned by the royal Conti family during the late 17th century. The mint runs a secondary facility &###x2014; its monetary establishment in Pessac &###x2014; where the nation's circulation coinage is currently produced. At Provident, our primary goal is to make it simple and safe to invest in precious metals. We sell only genuine bullion products sourced directly from the mints that produce them, such as the US Mint, Royal Canadian Mint, Perth Mint, and more. In addition, our inventory holds a unique mix of products that you can only find at Provident. Additionally, our team is committed to offering exceptional customer service at every step of the investing process. You can rest easy knowing that you will get exactly what you ordered each and every time. All packages are fully insured during transit. Will I receive the exact item pictured? All photos are stock and are meant to represent the type and quality of item you will receive. Spot price is the market value of precious metals at a given point in time. Nearly all products in our store are priced at a premium or discount to the spot price. As spot price moves up and down throughout the day, so will the price of the product. How often are prices adjusted based on spot price? Similarly, our traders are NOT commissioned. What you see is what you get. Can I cancel my order? Cancellations are considered on a case-by-case basis. Is there a minimum order? There is no minimum order. Can I change my order once it has been placed? No changes can be made to the items included in an order once it has been placed, but a subsequent order can be placed. Yes, you can apply those monies at checkout. Will my order be insured? First off, we are sorry this happened. That said, it does happen, but we will make it right. We always do our best to do right by our customers. How long will my order take to get to me? This listing is currently undergoing maintenance, we apologise for any inconvenience caused. 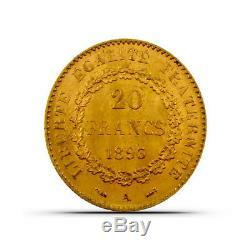 The item "France 20 Francs Angel Gold Coin 0.1867 oz Random Date Extremely Fine (XF)" is in sale since Wednesday, May 9, 2018. This item is in the category "Coins & Paper Money\Coins\ World\Europe\France". The seller is "providentmetals" and is located in Addison, Texas.